There isn’t really a dress code when it comes to travelling by plane. You can practically wear pajamas and nobody would bat an eye on you (or maybe a few), especially when you’re going to be travelling for more than 10 hours. Sitting still on your seat, whether business class or economy, you just need to feel cozy. But you’re a grown woman and it just isn’t comfort you need to worry about. You’ll need to be comfortable and in-style. You’ll never know what could happen- you could meet a really cute boy there and look like you just woke up and ran to the airport, or you could become a movie star. The thing is – you just need to look – at least – presentable. We’re not saying you should wear a sequined dress, a tight little black dress or even thigh-high boots because let’s face it; nobody likes to wear their best outfits on a stuffy and overcrowded plane. Still clueless? We’ve rustled up a couple of stylish and cozy outfit ideas inspiration from the celebs that will be perfect for travelling. 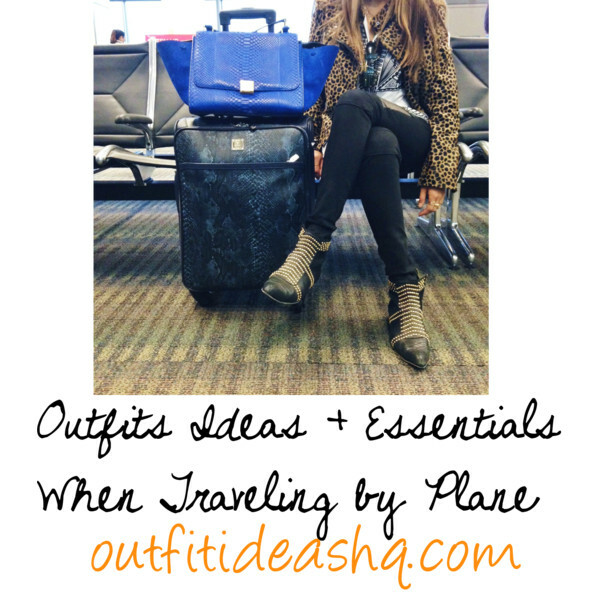 Also, at the bottom of this post are some important travel must-haves that you need to store in your carryall. You could wear simple jeans and shirt and just wear a statement outerwear to look cool and put together. A chic matching camel coat and pants with cap-top pumps is an alright outfit, especially if you’re only travelling for a couple of hours. 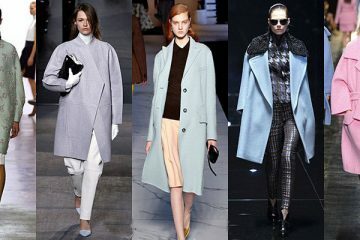 You can even wear a cozy oversized sweater and a fuzzy black coat and leggings. Complete the look with a chunky necklace. A shirt dress, tights and boots for that simple yet stylish look. Look refreshed and chic with a loose shirt, boots, aviators, black jeans and colorful bag. Feel like a model with white tee, a coat, ripped jeans and a wide-brimmed topper. Experience the A-list glam and treatment with an oversized shirt, black leather jacket, jeans and an oversized white fur wrap. Casual-chic look with chunky sweater knit, denim jeans and laced-up boots. Take inspiration from this colorful look with floral pants, grey sweater and flat sandals – perfect when you’re travelling to a warm city. Transform the airport into a “fashion runway” with a collared button-up top paired with silk and billowy pants. Bundle up for warmth with a black knee-length coat with fur lining and boots. 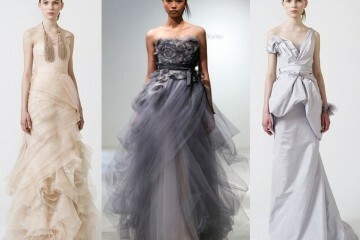 Grey sweatpants, striped tee, sneakers and a blanket poncho or a cape. 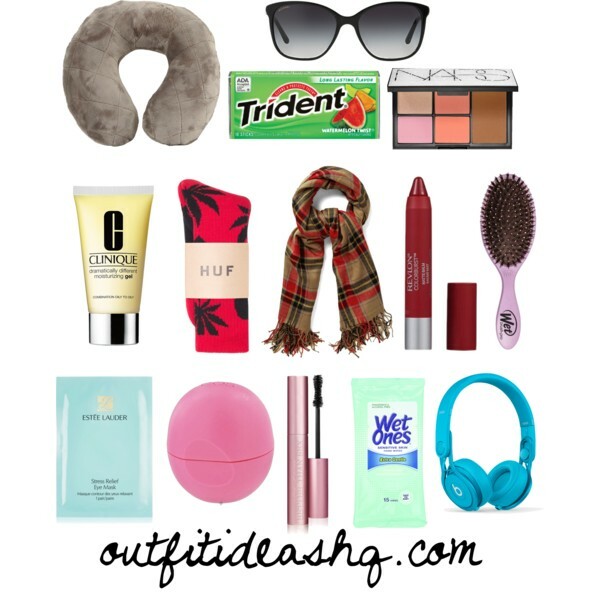 Travel Essentials – neck pillow, sunglasses, gum, eye shadow + bronzer + blusher palette, travel-sized moisturizer, fuzzy socks, scarf, kiss-proof lip stain, hair brush, eye mask, lip balm, mascara, wet wipes, headphones.